Lily (Lilium spp. ): growing, planting, caring. Many colors and sizes to choose from ! Scientific name : Lilium spp. Lilium is a genus of about 100 species of herbaceous flowering plants growing from bulbs, all with large flowers, native to the temperate northern hemisphere. They are tall perennials ranging in height from 60 to 180 cm (2-6 ft) and form underground bulbs which are their organs of perennation. The flowers are large, often fragrant, and come in a wide range of colors including white, yellow, orange, pink, red and purple, sometimes with spots or brush strokes, appearing in late spring or summer. The lilies belong to the Liliaceae family, they are bulbs or rhizomatous perennials, with erect stems unbranched. They bear lanceolate or linear leaves, dark green, arranged in whorls, spirals or alternated. The flowers' shape can be a cup, a trumpet, a turban or a funnel. They are sometimes very fragrant, and are organized solitary, umbels, panicles or clusters. You should plant the lilies in the fall. 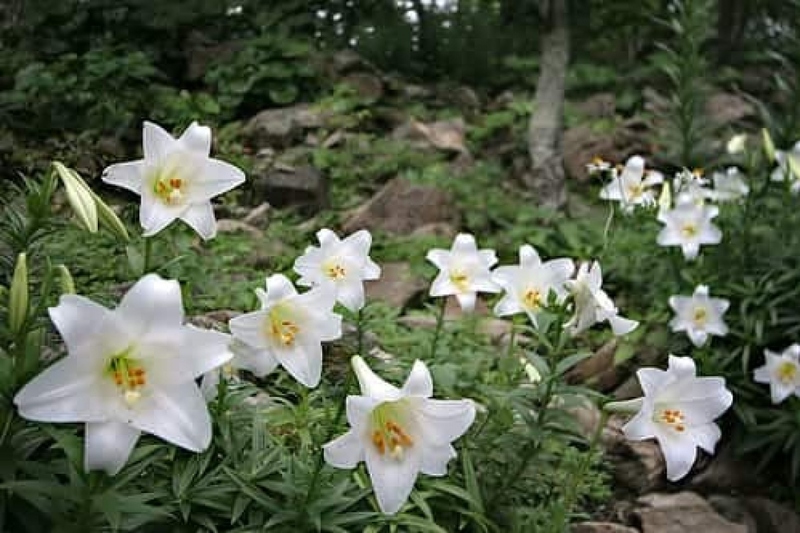 In open soil, place your lilies in full sun, preferably with the base in the shade, in a soil rich in decomposed organic materials, well drained. Mulch at the plantation, water. In pots, choose lilies with small development, install them in potting soil, with a draining layer at the bottom. Mulch around the base and water. Make sure your pots are well drilled in the bottom, the lilies would not survive in stagnant water. Space each foot by 15 cm because the lilies do not expand much in width. Thoroughly tamp the soil to not let air in contact with the roots. Water regularly the first weeks. The watering of the lilies is also recommended from spring until the formation of the flower buds, but then, they support the drought quite well. In pots, it is recommended to water regularly in summer to avoid drying out the plant. Fertilize before winter (while mulching for example), moderately decomposed compost or manure, and by a light scratching to incorporate. In this way, your intake will have time to decompose itself and will be available in the spring when the plant is restarted. In the spring, a supply of wood ash will help flowering. Watch for decocids, aphids, slugs, thrips and needle twigs - that attack the leaves, and can be removed manually - as well as slugs, rabbits and voles. Botrytis takes advantage of cold, wet springs to develop and cause rots.